Japan Farmers Markets: Chicken Soup for the Soul: Merry Christmas! and I'm in it! 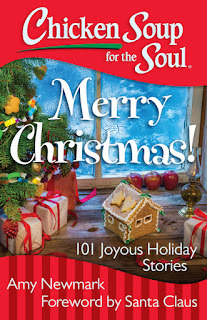 Chicken Soup for the Soul: Merry Christmas! and I'm in it! I usually don't write personal headlines like that one, but I am very, very excited to be in Chicken Soup's latest Christmas anthology. I wrote about a favorite Christmas in Japan, while we still lived in Tokyo. It didn't start out to be the best by any means, but good friends and a special event turned that all around. Dear me, I'm tearing up just thinking about it. If you get a chance, grab a copy or buy it as a present and read the essay before you wrap it!